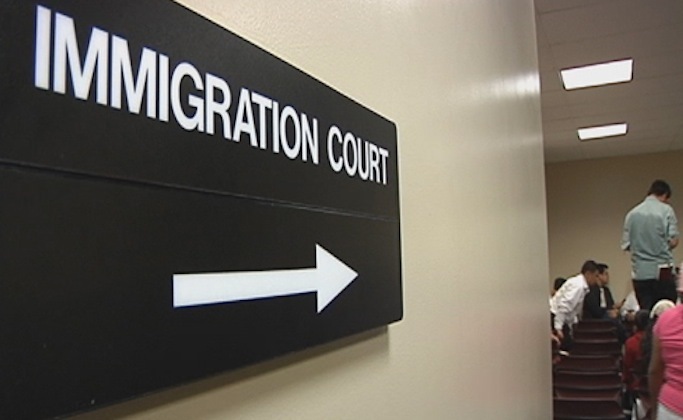 In a scathing report issued today, the American Bar Association (ABA) said that the nation’s immigration courts are “irredeemably dysfunctional.” The stresses put on the immigration courts by the Trump administration have brought them to the breaking point. The ABA warned that the “immigration courts are facing an existential crisis,” that could wreck them. Constant policy changes by former Attorney General Jeff Sessions as well as an unprecedented number of arrests of immigrants by ICE who are then placed under the jurisdiction of the immigration courts have take the immigration system to near collapse. Unprecedented delays have been one result of the Trump policies. The backlog in immigration court has grown to three-quarters of a million cases, the most in the history of the system. “Zero Tolerance” polices, round-ups of immigrants without any criminal histories, and the mass incarceration of immigrant children have all contributed to the problem. So too has the Trump administration’s constant reshuffling of court priorities, which seem to occur several times each year throwing the courts into chaos. The recent government shutdown did not help matters. Even worse, the ABA found, “judicial independence has been called into question with a resurgence of alleged politicized hiring and the adoption of policies that arguably undermine immigration judges’ ability to perform their role as a neutral arbitrator of fact and law. These concerns go to the very essence of an impartial court.” Good judges are leaving the immigration courts and they are being replaced by new judges hired by Jeff Sessions and his successors.